Now that scientists are actually studying canines, we know that dogs are not pack animals like wolves, as was once believed and do not form linear dominance hierarchies amongst themselves. Even our knowledge about wolves has changed, and while dogs are related to wolves, they are different from them in many ways. Dogs are social animals, however, and your family is now your dog’s social unit. For dogs to fit comfortably into human society, it is important that they learn how to behave appropriately. One definition of leadership in business is: “. . . the ability to guide others without force into a direction or decision that leaves them still feeling empowered and accomplished.” This is actually a good description of dog training using mostly positive reinforcement. In a human family with children, adults “lead” by teaching children the rules about how to act, and this works well with dogs too. Forget outdated ideas about “dominating” dogs which are incorrect, dangerous and ineffective in the long run. Never use physical moves like alpha rolls, scruff shakes, kicking, or jabbing to attempt to intimidate your dog into behaving. This will only erode your dog’s trust in you. A “soft” dog may become fearful and nervous, and a confident dog may become aggressive. Experts suggest that the only time one canine throws another canine to the ground, outside of play, is when he means to kill that other animal. It’s only surprising that dogs don’t try to defend themselves from people more often. In fact, in both human and animal societies, it is usually insecure, low-status group members who use violence in attempts to get their way — not the message you want to send. A true leader is not a bully and never uses fear, intimidation, or physical punishment to control others. You might be able to intimidate your dog into behaving, but most of us get dogs to be our best friends and to have fun with. We want them to respect us, not fear us. A true leader is benevolent and kind, but also firm and consistent. The fast, easy, efficient and safe way to have a well-behaved dog is by teaching them that all the things they want can be obtained by showing polite behavior — or maybe even a trick that you teach them! We usually call that “obedience” or good manners! Your dog will listen and respond to you if you make it worth their while to cooperate. 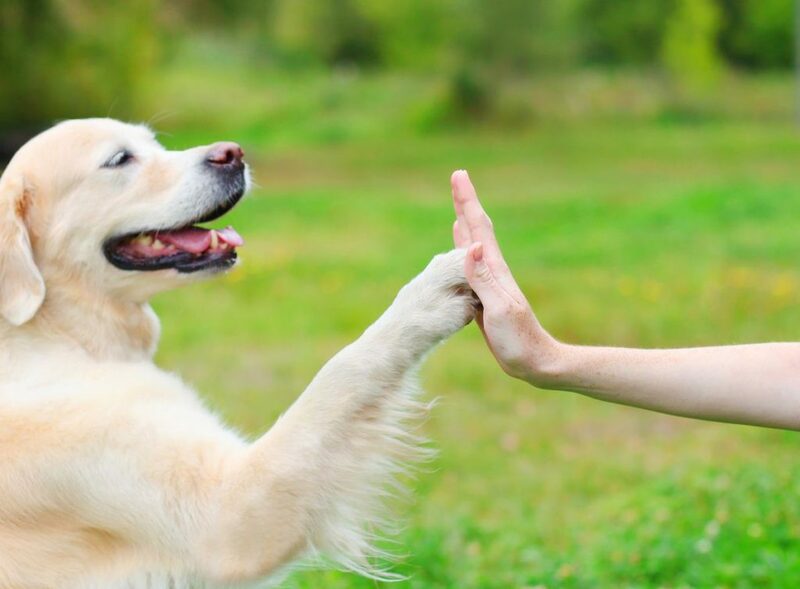 A good positive reinforcement-based trainer can show you the best way to do this. Once your dog realizes that you are the provider of food, toys, social interactions, comfy resting places, freedom — all the things that dogs want — you become very important to them. Because we hold this much power over our dogs’ entire world, it is only fair that we give them as much choice and access to good things as possible. We can hand out the good things in exchange for the dog’s good behavior. If he wants to say hi to a person, he has to keep all four feet on the floor. He wants you to throw his toy, so he has to stop barking first. You want him to lie down quietly while you have coffee with a friend, so you give him a chewie when he does it. Your dog will soon understand the contract between the two of you: he gives you the good behavior you want and you give him the good stuff he wants. Both sides win! ← Don’t Go To Obedience Classes!